I don’t think I’ve ever installed a “perfect” invisible zipper. 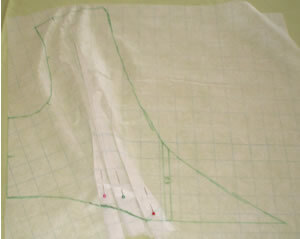 My Achilles tendon is the bubble that wants to form at the bottom of the zipper, I think because the fabric stretches in one direction when you sew the first side of the zipper and then stretches in the other direction when you sew the second side. That said, my invisible zippers look pretty damn good and by far better than lapped or centered zippers. Here is the best tutorial I’ve ever seen on inserting an invisible zipper. It has clear pictures and instructions. One thing I can add, if you can’t find the perfect color zipper, the zipper stop (the only part that shows on the right side) can be painted with model car paint available at hobby and toy stores. This gives many more options to match the color of the zipper stop to your garment. Well, I’m back to my old ways–my daughter’s graduation ceremony was yesterday and I made this dress yesterday morning. Good thing I’m an early riser (a little too early–4 a.m. since my trip to India). So, I made the dress, cooked the food for the graduation party, picked-up the graduation cake and was at the ceremony at 2:00 p.m.! The dress was perfect, we’ve been having a heat wave in Chicago and it was steamy and humid yesterday so this bright, cool dress was just the ticket. The only thing I didn’t have time to do is to shop for sandals. I was craving a pair of silver sandals to go with this dress. 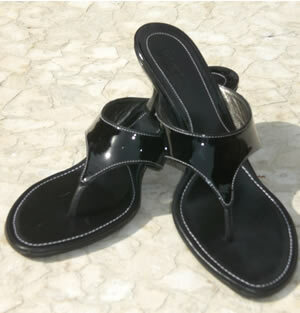 Luckily, I bought these cute Cole Haan black patented leather thongs on sale in January (at the Saks Fifth Ave. Outlet, must’ve been from last season). 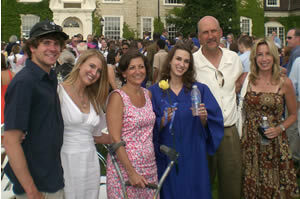 They worked out fine and I was pleased to be able to walk easily with the heels and crutches. File this under “I’m so glad I can sew”, I made this dress with a stretch cotton that was on sale for $3.99/yard. It was 60″ wide and so the dress only took one length of fabric, about 1 1/4 yard. I used an invisible zipper and a stretch cotton from my stash for the lining. The total cost was about $10.00. I featured the Michael Kors version of this dress in my entry titled “What to Wear”. I tried to find it again on the web, but they must all be sold out, as I recall it was about $1,200. 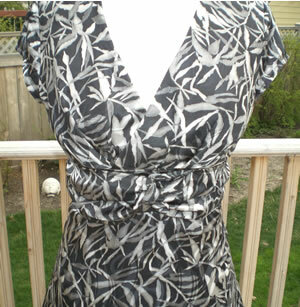 I used Butterick 4778, a Nicole Miller design, which has been discontinued. Sorry to use an out-of-date pattern, but E. has been giving me a hard time about doing too much and not resting enough since the surgery (sound familiar anyone? ), so I didn’t want to ask him to take me to the fabric store for a new pattern. 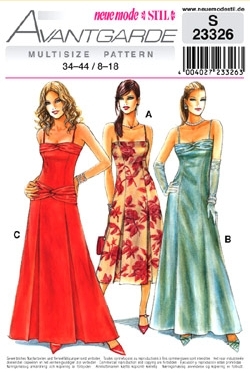 This pattern has just the right design elements–princess seams in the front, scoop neckline in the front and square neckline in the back, very fitted and tapered at the hem. I’m sure there is something similar available in a current pattern. The only pattern alteration I made was to cut the dress off to street length and omit the placket, buttons and front slit. With the shorter length, I didn’t need the slit for walking room. I was really happy to do an easy project without many changes, seems like everything I’ve been making lately has been so complicated. A perfect fit was the most important priority for this dress. As stated previously, I’m lazy and seldom make a fit sample before I cut into my fashion fabric. This time, I cut the lining first and added a generous amount to all the fitting seams; side seams and front princess seams. 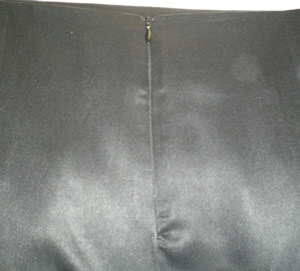 Then I basted the lining together and tried it on, with the seam allowances outside. I then pin fitted very carefully to my body, re-basted on the new fit lines, tried on again, just to be sure, added seam allowances to the new seam lines and trimmed off the excess fabric. I removed the basting and used the lining as a pattern for the fashion fabric. This worked great! 1. 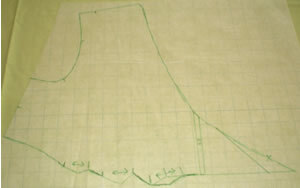 I “bagged the lining”–I cut the lining 1″ shorter than the fashion fabric, after constructing the dress and the lining, I sewed the bottom hems of the dress and the lining, right sides together then pressed the finished hem in place. Because the fabric was easy to press, I didn’t need to hand hem the bottom edge. Because the shoulder strap area was quite narrow, it was a little tricky sewing the final seam. I was saved by my Bernina Open Toe Foot, it’s good at getting into small places. I took 3-4 stitches at a time, adjusted the fabric, took 3-4 more stitches, etc. 3. 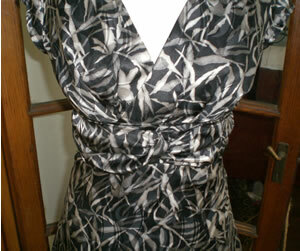 The pattern called for seam tape to stay the neckline edge. My fabric is stable and a little heavy, so I skipped the seam tape and just stitiched the neckline edges to stay them. I didn’t end-up with my customary bubble at the end of the zipper–yea! At the neckline, the zipper stops were perfectly placed on both sides. From the bottom of the zipper to the hem, I did have to ease in a little extra fabric on one side. Seems like it’s almost impossible to avoid this, because of fabric creep, I expect. I placed the zipper stops right at the 5/8″ neck seam, hoping the zipper would close perfectly without a hook and eye. I’ve seen this on RTW, but it didn’t work. It spreads a little at the top. I hate that. When a detail is at the center back, it seems to glare at you if it’s not perfect. 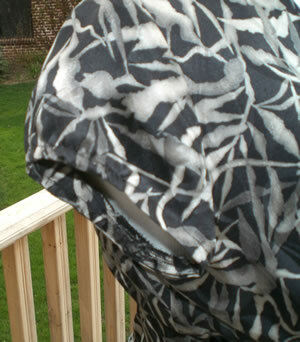 Next time, I’ll put the zipper stops about 3/8″ below the neckline seam and use a hook and eye. 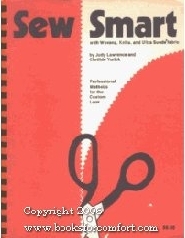 (I should take my own advice in the post “How to Fix all Small to Medium Sewing Mistakes”. This dress will come in handy all summer, for dinner out on a hot night, a casual summer wedding or cocktails at someone’s home. If I can manage to lose the last 10 lbs. I gained between being marathoner and semi-cripple (I can start swimming next week, so that will be a great help) it will be easy to take in the seams on this dress and keep that fitted shillouette. Yes, I did finish the outfit I told you about in my very first post titled Welcome to The Feed Dog. I wore it with the TSE black silk skirt that I re-designed in Project MyWay #1 and my beautiful cashmere knit coat from Project MyWay #3 and my cute booties that I got on sale at Macy’s (marked way down in February). We went to the city for dinner and then to a jazz club and I looked very ou current! This beatiful silk satin burnout fabric was in my stash, next time I’ll try it in a solid color so the details won’t get lost in the print. I wanted the cross over bodice with pleating and the sash under the bust, but the sleeves are too “girly” for me, so I wanted a simple cap sleeve. Simplicity 4277 was a good place to start, it has the basic design of the Nanette blouse and the changes were easy to make. I figured out the pleating by folding the new front pattern piece and matching it up to the top of the waistband until it fit. After cutting out the fabric, I pleated each front piece, then lined them and basted the 2 fronts together at the center front. I used the hip sash from View C and cut it to fit when I was constructing the waistband. 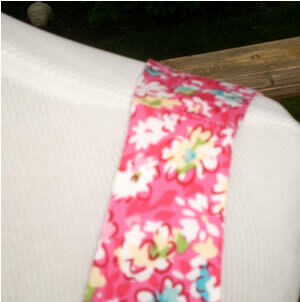 I made the sash for the front only–from side seam to side seam. I didn’t want to deal with it in the back as it would have ended at the center back and made the zipper application very difficult. 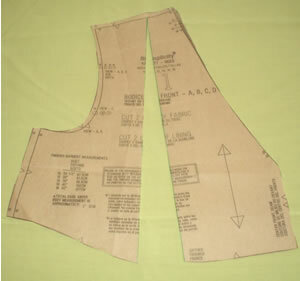 The cap sleeve offered in this pattern is gathered at the cap. I didn’t want the gathering, so I used the set-in sleeve of view A and re-drew it into a cap sleeve. I then tried something new I saw on a Banana Republic dress, I put a piece of elastic at the center of the hem of the sleeve, about 2″ on either side of the center, for a total of 4″, to pull it in a little. I love cap sleeves because they are great for summer dresses and blouses, but give a little more coverage than sleeveless tops. But cap sleeves look awful when they point straight out like wings. I find the best looking cap sleeves have plenty of ease in the cap (without being gathered) and this Banana Republic method of inserting elastic at the sleeve hem makes the sleeve nice and fitted. I always self line cap sleeves, it looks so much nicer than narrow hemming the sleeve. 3. I inserted a new invisible zipper. As usual, I ended up with a bubble at the end of the zipper. I found a great tutorial that I’ll try next time, it’s a little fussy for me, but at least I’ll baste the zipper in first and I think that will avoid the bubble. http://sewiknit.blogspot.com/2006/03/invisible-zipper-tutorial.html I never use an invisible zipper foot, just a regular zipper foot and I smooth the coil open as I sew. 4. 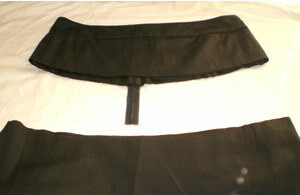 I tried on the skirt and fitted it to my waist using the 6 seams–two side front seams, two side back seams and two side seams. 5. 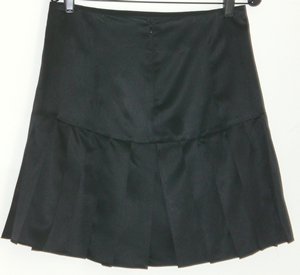 I cut a facing from the upper skirt that I had cut off and finished the new top with the facing. 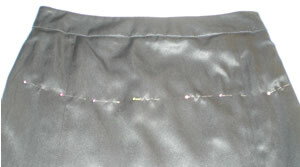 The skirt is lined, so I re-inserted the lining before I sewed on the new facing. 6. Voila! 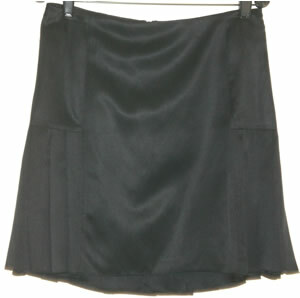 A new skirt that is shorter and perfectly fitted to my waist–it’s gorgeous! The back is still longer than the front. The only way to change that is to re-hem the back. I don’t want to do that and it looks good as is.